This is seriously one of the easiest recipes I've come across. I'm not the type of baker who sifts flour, uses three different bowls, or even melts butter (oh the shame). I'm telling you, this recipe is a 'chuck it all in a bowl and mix' kind of recipe! It's quick and easy, one bowl required, and only takes about 40 minutes all up – including clean up time! What's best, you probably have all the ingredients sitting in your pantry right now! It's the perfect, I have nothing to offer my guests (lightbulb moment) I'll quickly whip up a batch of muffins to go with tea, kind of recipe. I really love the sweetness of raspberries complimented by the creaminess of white chocolate. 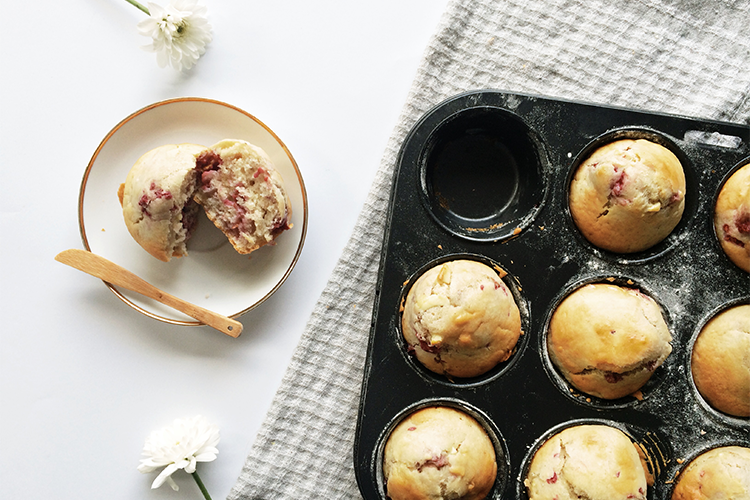 Hence why I made these White Chocolate and Raspberry Muffins. But if you're not a fan of these flavours, then you're in luck, this recipe can be crafted to any flavours you like! Just substitute the raspberries and chocolate for anything, seriously, ANYTHING! I've used the crux of this recipe multiple times in completely different ways, and it works! If you give this recipe a go, let me know how it turns out! Preheat oven to 180 degrees. Prepare a muffin tray. Either use patty pans, or butter the tray and splash flour over the butter, this will make the tray non-stick. Add all dry ingredients into a bowl, mix till combined. Add all wet ingredients, mix till combined. Add in your flavourings. Place mixture into previously prepared muffin tray. Fill tay 3/4 full, this will give room for the self-raising flour to work its magic! Bake for 25 minutes, or until golden brown and knife comes out clean. * This recipe is really a basic muffin recipe. You can substitute the raspberries and chocolate for anything. It's really up to you!